Can we improve the information given to patients for wound care and reduce the risk of readmission for wound infection? The Patients Association, in collaboration with Royal Brompton & Harefield NHS Foundation Trust is running a survey to find out about patient, carer and the public’s view on ‘Photo at Discharge’. 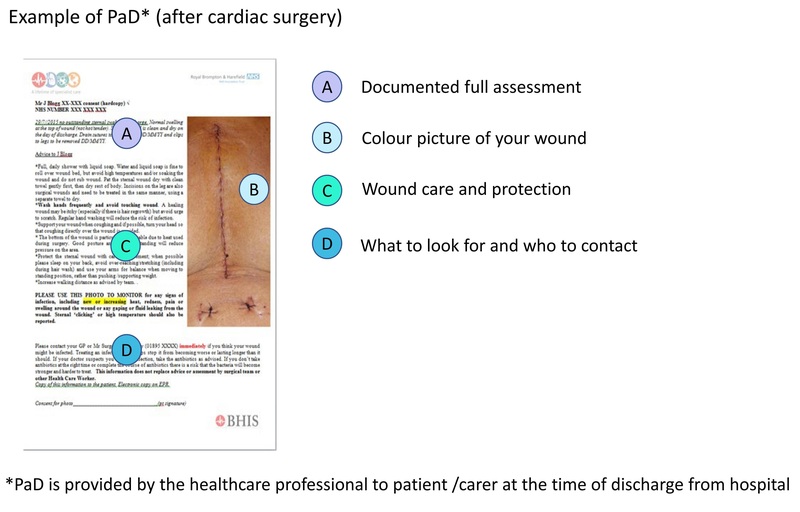 A photograph is taken of the wound at the point of patient discharge by the nurse and is given to the patient/carer, this is the ‘Photo at Discharge’ (PaD). The aim is to provide a clear, patient-centred assessment of the wound for the patient's records and the healthcare provider(s). An example of PaD is provided below. The photo can help to monitor the healing process and spot any changes in the wound quickly; it may also mean that the patient may not need to take antibiotics unnecessarily. Hospitals such as Harefield and St Bartholomew’s have successfully offered PaD to all their cardiac patients over many years. Local feedback from patients and carers is extremely positive: PaD provides important reassurance, increases confidence in wound care and is very useful in wound reviews. Other centres, such as the Royal Marsden Hospital, are trialling the Photo at Discharge’ in new patient groups. We are now looking for national views on the award-winning scheme. We are asking for your views to help us apply for funding, as well as to generate support for developing PaD as a national standard for patient/carer information on wound care. Please answer the questions below to share your views on this topic. All feedback gathered from patients and carers will be anonymous. * 3. If you have any other comments to share regarding the Photo at Discharge then please use the comment box below. This section is optional. We are asking for these details to make sure we are collecting information which is representative. This is to make sure that we identify and address each patient’s needs and ensure that all patients get the best care possible. * 4. Have you or someone you have cared for had surgery in the last 5 years?